Reconstruct Hicks Pike from two to three lanes. Consider an urban cross section with curb and gutter. Include a multi-use path along one or both sides of the roadway. Improved roadway geometry will enhance the safety along Hicks Pike for current and future anticipated additional vehicles resulting from additional residential development in the area. 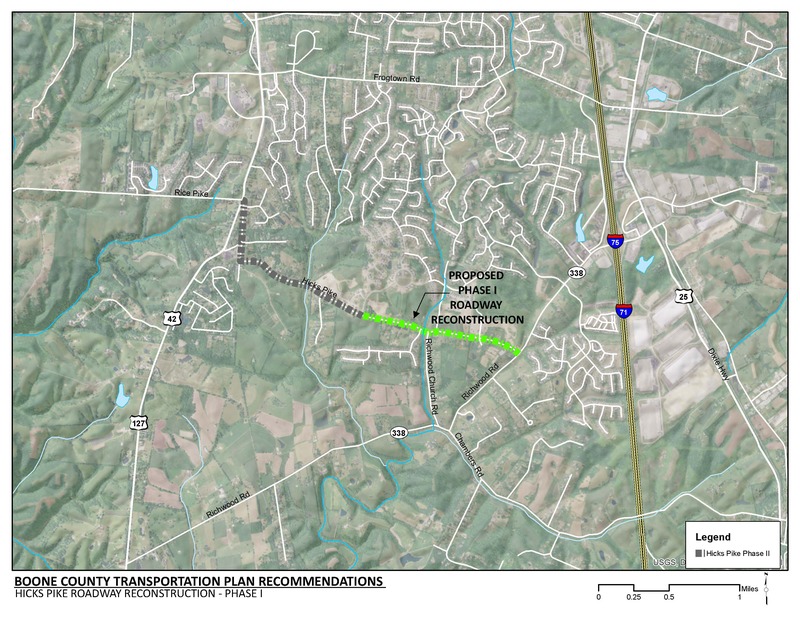 New sidewalks or multi-use paths will provide a connection to the bicycle and pedestrian facilities that are included in the KY 338 (Richwood Road) and US 42 recommended widening projects and the amenities along these routes. The multi-use paths are consistent with Boone County’s overall goal to improve bicycle and pedestrian connectivity. Click HERE for a map of multi-use paths in Boone County. This phase of the Hicks Pike reconstruction project will require reconstruction of the bridge over Mud Lick Creek. The project will need to be coordinated with the Boone County Planning Commission to accommodate anticipated future development in this area. Additional right-of-way will be required to implement this recommendation. The residential development planned along this roadway is expected to use Hicks Pike as a primary connection to I-71/75. Traffic demand along roadways and at cross streets is expected to increase as residential development expands in this area. By year 2040, population to the south of Hicks Pike is expected to grow by 4,500 homes. Also by year 2040, population to the west of US 42, near Hicks Pike is expected to grow by over 3,000 homes. The existing cross section consists of 10 foot lanes with no shoulders. The deficient lane width and absence of shoulders create a safety concern for current and future increased traffic volumes. There are no dedicated bicycle or pedestrian facilities along this roadway. Residential development is likely increase the pedestrian and bicycle demand in this area. There is a multi-use path included in the recommendation to widen KY 338 from Hicks Pike to the I-71/75 interchange improvement. There is no existing pedestrian or bicycle provisions to connect pedestrian traffic to these planned facilities.